The Siberian Ginseng Extract has been developed from traditional Chinese formulas combined with modern scientific techniques using only the most select premiere Siberian Ginseng roots. Siberian Ginseng is mainly grown in parts of Russia Far East, Korea, China, and Japan. Although Siberian Ginseng possesses many of the same effects as other ginsengs, it is generally regarded as being milder in action. 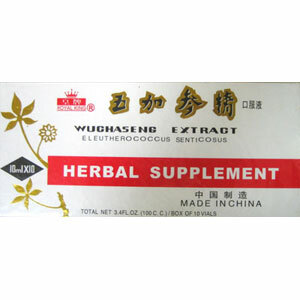 Research in China has suggested that Siberian Ginseng (Ci Wu Jia, Eleuthero) is especially effective in relieving fatigue. It has a greater stimulating effect than Ginseng; but it can also calm the patient and reduce anxiety. It also strengthens the immune system. It is useful in protecting the body from damage due to radiation. It decreases inflammation. It also normalizes blood pressure. If the blood pressure is too high, it will lower the blood pressure, if it is too low, it will raise the blood pressure. Research in China has also suggested that this herb, Ci Wu Jia, has the effect of increasing endocrine function (ovaries, testes, adrenal glands). It will increase insulin, and decrease blood sugar if it is excessively high. It has an antidiuretic property and will help prevent the patient from producing excess urine. Siberian Ginseng has been administered to more than 2,100 healthy human subjects in clinical trials for the purpose of evaluating its adaptogenic effects. These studies indicate that Siberian Ginseng can increase the ability to withstand many adverse physical conditions such as heat, noise, motion, workload increase, exercise, etc. It can increase mental alertness and work output, and improve the quality of work produced under stressful conditions as well as athletic performance. Siberian Ginseng appears to address the fatigue, decreased sense of well-being, and impaired immune function in people with Chronic Fatigue Syndrome. Water extract of Siberian Ginseng root in honey base, alcohol free. 1 Vial, 2 times a day on an empty stomach; once in the morning, and once in the evening with warm water. Some settling may occur that will not affect the quality or taste. Shake well before using.